Building upon its legacy of manufacturing quality firearms at an affordable price, Stoeger introduces the all-new STR-9 striker-fired, semi-automatic pistol. Chambered in 9mm with a 15+1 capacity, the STR-9 blends form and function to create an all-around solution for everyday carry, home protection or fun at the range. The STR-9 features a corrosion-resistant black nitride finish, available interchangeable backstrap grips for a custom fit and 4.17-inch barrel for easy concealment and quick deployment. With an overall length of 7.44 inches and weighing 1.5 pounds, the STR-9 is designed for personal protection without breaking the bank of manufacturing quality firearms at an affordable price, Stoeger introduces the all-new STR-9 striker-fired, semi-automatic pistol. Chambered in 9mm with a 15+1 capacity, the STR-9 blends form and function to create an all-around solution for everyday carry, home protection or fun at the range. The STR-9 features a corrosion-resistant black nitride finish, available interchangeable backstrap grips for a custom fit and 4.17-inch barrel for easy concealment and quick deployment. With an overall length of 7.44 inches and weighing 1.5 pounds, the STR-9 is designed for personal protection without breaking the bank. Rugged and reliable, the STR-9’s grip angle is engineered to match the drift-adjustable, three-dot sights for true target alignment and combines with a low-bore axis for reduced muzzle rise to quickly reacquire targets for follow-up shots. Aggressive front and back slide serrations provide a firm grasp with or without gloves. A smooth-pulling, crisp trigger houses an internal safety for extra security. For an added benefit, an accessory rail accepts a wide variety of pistol and laser lights for low-light conditions. The reversible magazine release allows for right- and left-handed shooting. Durable and reliable, the STR-9 delivers the perfect personal defense pistol at an economic price. 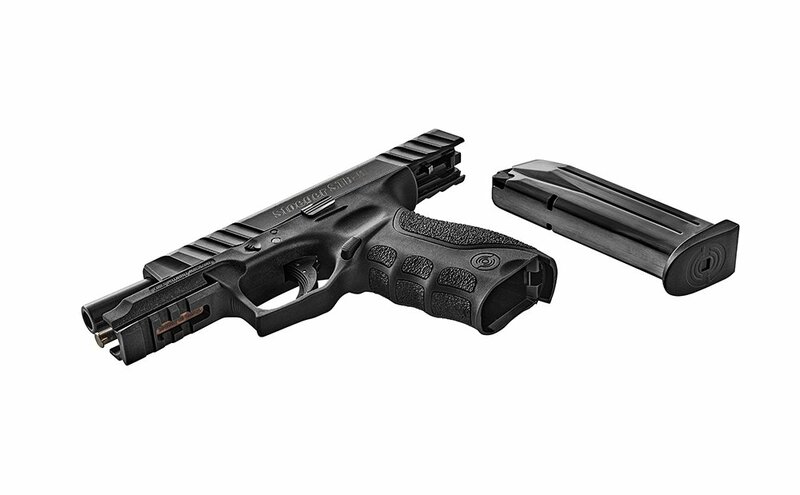 The new STR-9 comes with one magazine, lock and loader and has an MSRP of $349. For the latest news and product information visit www.www.stoegerindustries.com.